Martin Maruskin blog (something about SAP): Are your BW users still using BEx 3.x? To see BW of version lower than 7.x is quite rare case nowadays. Most of the present BW systems are running on version 7.0+. It has been almost decade now since first version of BW 7.0 was introduced in 2005. With evolution of BW backend its frontend system progressed as well. Despite of having many frontend tools in eyes of most of BW users the "main" frontend tool still remains BEx Analyzer. There are two significant releases of BEx tools. Within introduction of BW 7.x the BEx which was present at that time was just renamed to BEx Analyzer 3.x and new release of BEx compatible with BW 7.x was released. The old BEx Analyzer 3.x (also known as BEx 3.5) was still shipped with SAP GUI and once deployed there are both version available for the user. As the both versions are available some user may try to still using the old one maybe not knowing that it is the old one. It was not issue until version 7.4. Actually within the 7.4 BEx 3.5 cannot be used with BW 7.4x. This is official advice from SAP (see Note 1410878 - Maintenance for BW 3.5 front-end add-ons). 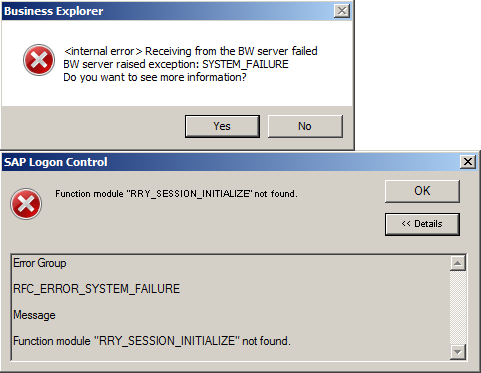 This fact is even more stressed out in the note 1932461 - SAP BW 3.5 BEx tools / BW 3.5 frontend add-ons are incompatible with BW7.4. But what will happen when we (despite all the advices from SAP) try to use old BEx? In case of Query Designer (QD) there is a warning pop up saying that component (BEx Query) was edited with recent version of BEx. So in case you are on BW 7.4 and you observe such a dump you may want to check with particular user and advise him/her to start using regular BEx Analyzer instead of old one. Because only this dump is sign that some users are still sticking into the old BEx! This Blog is handy , we have a same scenario where a user is not able to execute query and in system we could see dumps , As you said advice user to use regular Bex Analyzer from his laptop. Could you give more details on that , from where it can be launched , Currently we are on BW 7.4. 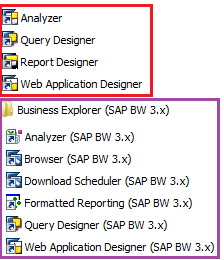 BEx tools of version 7.x can be found in Window's start menu under Business Intelligence folder.